The domino affect through the various production operations at Clairon Metals Corp.—begun in 2006 with the acquisition of new press-automation controls—has been significant and impressive. The results, some outlined above, speak for themselves. 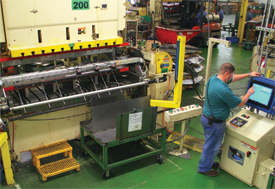 Clairon Metals operates a 114,000-sq.-ft. shop in Covington, GA, with 27 presses from 35 to 1100 tons. “We’re on the upturn now, finally,” says Butler, “happy to have been able to hire back several employees as our business has recovered from a tough 2009. We’re seeing a lot of takeover work from stampers less fortunate. Clairon, which supplies stampings and value-added assemblies to the automotive, ATV, HVAC, and metal-furniture industries, has evolved into a short-run high-mix operation to minimize inventory buildup and meet customer just-in-time supply demands. It runs primarily coil stock of cold- and hot-rolled mild and high-strength low-alloy steels, as well as plenty of 300- and 400-series stainless used for ATV exhaust components and other parts. A Clairon Metals press operator tends to one of 10 new press controls installed among the firm’s coil-fed progressive-die presses. 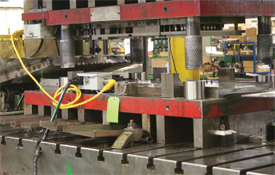 The new controls not only manage the firm’s aggressive die-protection program, but also direct all of the action in and around each press cell, including pulse-spraying of lubricant, operation of pick-and-place part-handling automation devices, pulsed air ejection to move parts off of dies, and shaker-conveyor action. for quality checks on first-parts off. Among the steps taken to quicken die changes: the shop now assigns a primary and secondary press for each tool, and stages the tools near that primary press; and, it modified all of its tools to accept a standard locating method in the press. The controls’ tonnage-monitoring capabilities are in full display at Clairon Metals, too. 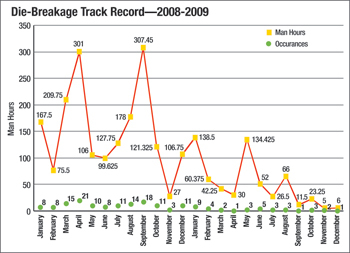 Tracking tonnage has allowed the firm to relocate several tools to different presses to avoid impending press damage. 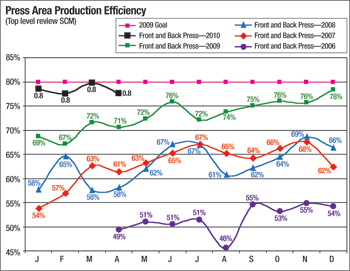 The domino effect from Clairon Metal’s ongoing improvements is best illustrated by this graph of production efficiency, which has climbed from barely 50 percent in 2006 to near 80 percent today.